I would expect the biggest win for this campaign to be in the very beginning when the novelty attracts people. I don't think this would be sustainable, because the QR code sculptures would require continual adjustment throughout the year to account for the procession of the sun. And clouds. At 1:09 in the video you can see the sculpture get pivoted on a horizontal axle. That is sufficient. At some point during the day (near noon if it faces south) the left/right alignment will be correct, at that point you can tip it on the axle for optimum legibility. The angle will vary by season, but if it is legible for an hour a day, there is a fair degree of slop available. It should be intuitively human adjustable, simply maximize the square pixelation nature, or if you want something more explicit, make the bottoms of the long vertical dark spots line up with adjacent short vertical dark spots. It is near June and they appear to be vertical. In the winter, with a lower sun, it will need to be tipped down and people will need to hold their phones lower and perhaps come closer. Good thing they didn't build it like this for winter. Then in the summer people would have to sit on a friend's shoulders to take the pictures. How difficult would it be to have the sculpture on a lockable swivel? Every month or so you just go out, realign it, and lock it back in place. Couldn't you just change the sculpture's orientation? Or is it more subtle than that? I think it's a win/win situation not just because of PR but also PR during the quietest hour. Foot traffic helps in retail. IMO this is a PR move, meant to garner publicity, but not really workable. The sun changes positions throughout the year, then there are clouds, it doesn't make sense. It would require hard shadows... since clouds defuse light resulting in soft shadows it wouldn't work if there are any clouds covering the sun. > As a result of its creative promotion, Emart reportedly saw membership increase by 58 percent in February over the previous month, they also observed a 25 percent increase in sales during lunch hours. While this is true and will most likely not work for all businesses attempting to gain publicity, they could always pivot the QR code to adjust for the sun's position and/or clouds. The box on the delivery made has some questionable spelling on it. There is a Team America joke in here somewhere. Very cool. A variation on this might be the create a QR code that can only be seen from a particular orientation - a bit like the 4 on the UK TV Channel 4 interludes. You could use it to ensure people were looking in the right direction or perhaps or at the right thing. Oh that's clever. Although it's less of an April Fool, more of an April prank. I remembered this story as a fake. Now I researched a bit and found out that this video really was just an advert concept, but later they made it real. > there is no need to wait in to collect them. Fast, asynchronous delivery is part of the puzzle. Waiting around for amazon deliveries is a pain; but for low-value groceries, the risk of theft isn't as serious. It works OK for newspaper deliveries, and when I was a kid we had milk deliveries left outside the door with no problems (yes, horse-drawn). This service would be even more awesome with self driving vans optimizing logistics. Now to solve the delivery from van to door problem - as usual the last 1% takes as much effort as the previous 99%. That's an interesting idea. 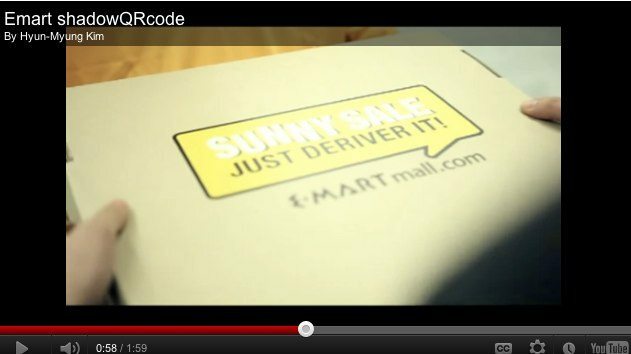 I'm coding Direct Store Delivery software that manages inventory through wireless handheld devices. The problem is that a lot of shipping is from vendor to store directly and the receivers are required to validate the shipment has the correct products, quantity, cost/deal invoice details and then work it out with the vendor delivery driver as needed. There are companies that strategically attempt to offload certain products that the store doesn't want at that point in time but will save the vendor $ if they can ship today vs. next week when different cost/deals take effect. That is awesome. Does anyone know if Peapod, Fresh Direct, or any other US based grocery delivery service has a API? I want to try something like this. When I read the headline I thought I was going to see a QR code printed in UV-sensitive ink. This is much more creative. Like people have said though, this probably isn't as maintainable as a UV-sensitive one might have been. For a more technological solution to the copied image problem, and also the reorientation necessary throughout the year, I think you could perhaps build a very large Pin Grid, with actuators for each pin, able to extend or retract them to the required position. Then you can figure out different patterns which are valid when lit from a particular direction, as well as altering the actual data it encodes, synchronised with updating the coupon code that merchants will accept. Could be kinda pricey for that number of actuators though, but if you were willing to have very slow update frequency, a single 2-axis adjustment head (think plotter or laser-cutter) with a smaller number of push/pull elements could move around, changing only X pins at a time, maybe with a friction lock to stop them moving once it progresses onto the next group. It will be an interesting challenge to write a program that can 'scan' the QR code at all time. Impressive. But you know what would be more impressive? Build a sculpture that yields different, valid QR codes in every season. It would be interesting to hack this and augment the sculpture to produce a URL under your own control. By changing the heights of the various protrusions, you could alter the shadows and thereby alter the code. Hopefully someone would be able to do this in an easy to reverse manner by taping on foam pieces rather than literally hacking pieces off. I wonder if you could hack it with a spotlight? You could just take a photo of the sculpture and paint it on your phone with a cheap editing app. You would just need to infer the shadow areas and paint them black, and the sunny parts white squares. QR codes were made to be very resilient to noise, and I can attest that you can mess with them quite a bit before they won't decipher. My boss asked me to take a QR code linking to our website and to try and rearrange some of the squares to be our initials. I got a few to work, and learned that the Reed Solomon encoding duplicates the data so much that this egregious manipulation was still acceptable. Of course by doing this, you remove some of the error correction. Your mutated QR code is less likely to be scanned by a camera which is lo-res, at an angle, in dim light or affected by some other imperfection. People who test customised QR codes almost certainly only test them under close-to-perfect conditions. My test conditions were transferring them to a black t-shirt with an iron-on printer sheet, and then taking a jpeg of my wife wearing it in the kitchen with an iphone and using a QR code recoder app. This is very clever. Of course, they will need to move the signs slightly every day, as the alignment of the 12-1 o'clock hour will change with the seasons. Also, what's preventing someone from taking a picture at the proper time and posting that photo on the internet? The article, in fact, does this. So nothing. It's just an ad. a statue is a permanent installation right? how do they prevent one guy scanning it and sharing the URL(?) to everyone? or just bookmark the url and open it again next day without scanning the statue again. I assume it goes to a URL which is only valid between noon and 1pm. The QR code is probably scannable during a time period slightly wider than that, depending on the time of year. It looks like the QR "statue" pivots to correct for the changing path of the sun across the sky, but the positioning doesn't have to be accurate to the point of working exactly from 12:00:00 to 13:00:00 local time. You can also add enforcement on the web server. You can actually just play the video on the linked article, pause it at the right time, and point your phone at the screen. If I could read Korean I might be able to tell if the site has a time-lock of some kind. This isn't really about being secure - it's about clever marketing. And it definitely succeeds at that. Maybe they'd like for one guy to share the URL with everyone. Yeah - I guess this is more of a customer attraction and branding scheme than foolproof. Tech-minded guys think of all these issues. It is a brilliant marketing idea! I would scan the QR code. So if you increase sales during certain hours, does that mean you make some sales that you otherwise would not have made or are you just shifting customers around different time slots? I'm sure it's a little of both. Sounds like they recruited a lot of new email subscribers, which is valuable. But, even shifting demand can be good if you can level out demand -- may mean fewer staff at peak times, shorter delivery queues, etc. Korea must enjoy fine sunny mornings I presume..